This rug is a perfect way to spice up your bathroom. 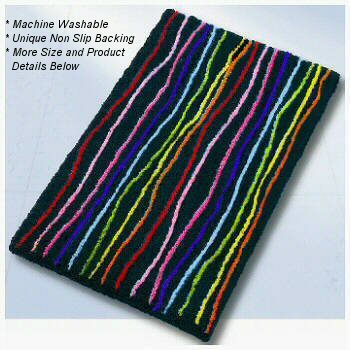 A rainbow of colored lines on a solid background with a premium non slip long wearing backing. High quality, dense, very soft rug with medium pile 20mm / .79in. Designed and produced by well-known German brand Kleine Wolke, established in 1968, and is backed by their quality guarantee.. Individually tufted and made of soft, durable polyacrylic yarn. Black: This fun rug has a black background with ruby red, bright orange, dark pink, light pink, aqua blue, royal blue, bright yellow and yelllow green 1/2 inch lines. Berry: Wine red burgundy background with dark pink, light pink, magenta and white 1/2 inch lines. Snow White: Snow white background with ruby red, bright orange, dark pink, light pink, aqua blue, royal blue, bright yellow and yelllow green 1/2 inch lines.